The #OneRoomChallenge from Calling it Home!!! What’s the ORC you ask? Why, only one of the most awesome decor challenges in Blogland! Linda, over at Calling it Home created the event as a way of motivating herself and other bloggers to completely re-vamp a room in six weeks. Yes, you read that correctly: SIX WEEKS! Now, six weeks may seem like a lot of time. And I guess it would be, if ALL YOU DID was work on the room. But we all have lives and jobs and families, so six weeks is going to fly by! Our master bathroom is… well… trapped in 1981. Brown and café au lait tub and tile. GIANT unframed mirror. Curlicue vanity hardware. Pseudo-Victorian “oil lamp” lighting. The real challenge here is not going to be re-doing this bathroom in six weeks. The real challenge will be re-doing this bathroom in six weeks for only $300! It’s not within our current budget to change the tile, tub, or toilet, so I’m going to be incorporating those colours. Brown and café au lait are not colours that I would ever purposefully choose, but after spending hours on Pinterest researching (and discarding) the options (painting the tile, changing the toilet and putting stick-on tile to the tub) I’m going to make it work! Tim Gunn would be proud. So what do I plan to do to make the brown tile work with and not against me? I have $204 left to work with. I think I’m going to have to get creative, especially when it come to the lighting. I have a few gift cards that I plan to put to good use for towels and accessories, so that should make my budget go a little further. If you have any suggestions for stretching my budget, or for framing out the mirror, I’d love to hear them! Ugly 80s bathroom. Minuscule budget. Six week timeline. Good luck! Can’t wait to see final results! Thanks! I can’t wait to share them. The plan looks great and will modernize your bath quite a bit! Looking forward to seeing the end result! I too am working with a tiny budget! That is the real challenge here! I can’t wait to see your final results! Good luck!!! Looking forward to watching your makeover! You have your work cut out for you!!! I love the color palette! Can’t wait to see the space come together! Yes, I certainly do! It’ll be a busy six weeks. I love all of the coral accents you are going to add! I can’t wait to see it complete! I love coral and I was surprised how well it works with the brown (I picked up some towels just to try it out)! I am redoing our master bathroom as well but I think yours might be more challenging than mine! I love a budget redo, can’t wait to see what you do! 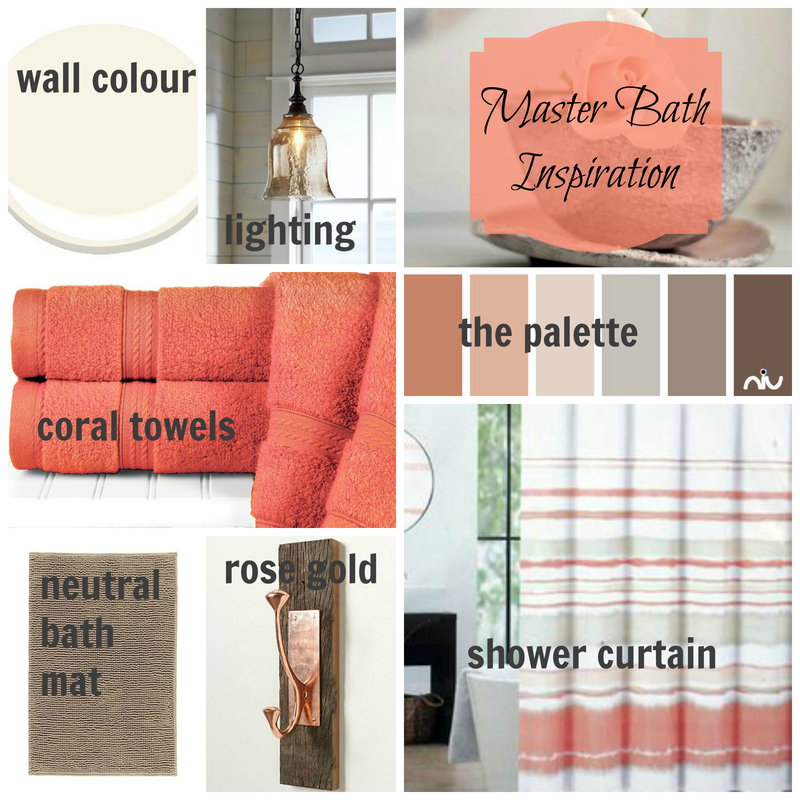 Coral is a fabulous color, love your mood board! Thanks, Ange. I’ll have to stop by to check out your plans. Yay!!! We can be budget friendly together! Sometimes you’ve gotta make the stuff you don’t love work for you rather than against you. Looks like you’ve got some great ideas! Best of luck! I bet the end result would be awesome. Wow…I’d love what $300 can do for this room. Look forward to following along! Thank you SO MUCH for contributing these ideas! I really appreciate your take on my decor woes. 🙂 I do actually have a good amount of storage, between the vanity and the linen cupboard (to the right of the sink), but I’ve always loved the idea of recessed shelving. When we gut this bathroom, I will be starting from scratch and will definitely be putting in a recessed cubby beside the sink. And for neutrals: yes, I agree. I think I’m going to paint the vanity the same colour as the walls to save a bit of $$. I AM considering a pop of colour on the inside of the linen cupboard, but we’ll see if the budget allows for more paint. Thanks again! Thanks, Tiffany! I love the look of rose gold and I think it’ll add a bit more interest than the usual oil rubbed bronze etc. Although we’ll see… All bets are off! hot damn…that light fixture you have hanging is gorgeous…I would just update the glass shade, but beside that it has potential. I love the colors you plan on going with and you have a beautiful blank canvas to work with. Thanks, Jessica! The light fixture isn’t really my style but that’s an interesting idea… I never thought of just updating it. Looking forward to your ORC room as well! Thanks, Hollie! That’s a good analogy. Looking forward to your creative solutions. Sometimes that’s the place where the best ideas come from. Good luck! I think your bathroom has lots of positives though, the window and the arch are appealing to me. Thanks so much for the positive feedback: I like the arch, too! Thanks so much, Sarah. Coral is a big favourite of mine. I can’t wait to see your final results! I love your color scheme! I love your plan, and that you’re making it work with what you have. May the decorating odds be in your favor! Thanks for the vote of confidence, Aimee! I can’t wait to see what you do with this bathroom! I love that you also have set a budget…I probably should do that! 🙂 I’m excited to watch the transformation and follow your budgeting! Thanks so much! Sticking to the budget will probably be the hardest part. Looks like you have a great plan! I love the rose gold!